An extensive restoration project has recently been completed, sponsored by the National Park Service, to ensure that future generations will not only be able to visit the Bodie Island Lighthouse, but also continue to climb the 214 steps to the top. The 156' ft. lighthouse still shines a beam 19 miles offshore, making full rotations at 27.5 seconds. In 1837, an expedition commissioned by the US government and led by Lieutenant Napoleon L. Coste began to find a spot for a new lighthouse on the dangerous Outer Banks. Coste finally settled on an Oceanside location in Pea Island, noting that "more vessels are lost there than on any other part of our coast." After a series of delays, construction finally began on a 54' ft. lighthouse in 1847, but major structural problems soon followed. The brick foundation was unsupported, causing the tower to lean within just a couple of years, and making subsequent repair attempts unsuccessful and incredibly costly. In the end, this first lighthouse was abandoned. A second 80' ft. lighthouse was commissioned in 1858 at a nearby site, but this new lighthouse met an untimely end just 2 years later when it was destroyed by Confederate soldiers during the Civil War. Luckily, the old adage "third time's a charm" proved true, and a third lighthouse was planned and began construction in 1871. This lighthouse was moved further North and further inland to a 15 acre site, and was nearly double the height of its predecessors. A lighthouse keepers' duplex was constructed at about the same time, and by 1872, the lighthouse was in operation, providing a beacon to passing ships with a First Order Fresnel Lens. In 1932, the Bodie Island Lighthouse became automated, and by 1953 it had been transferred into the care of the National Park Service. Since completion of recent restorations, visitors are again able to access the interior of the lighthouse, and the lighthouse grounds are still open for exploring and photos. The original light keepers' home, remodeled in 1992, now serves as a ranger station and Outer Banks information center. 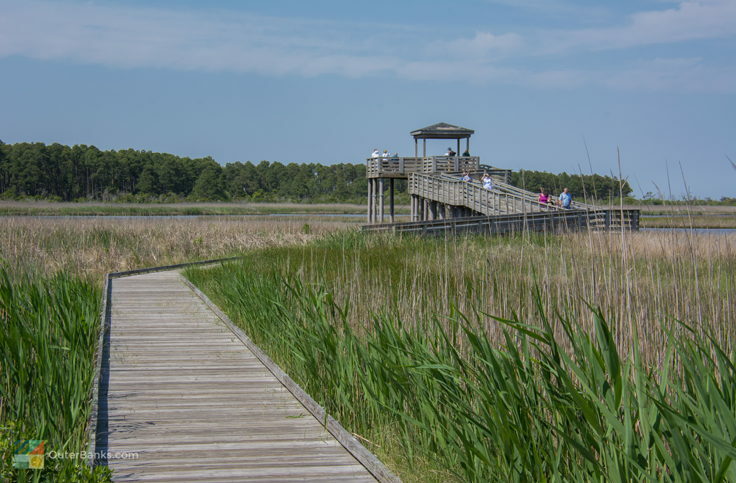 The grounds surrounding the Bodie Island Lighthouse, a mixture of marshlands, maritime forest and small saltwater ponds, are a popular destination for nature lovers and bird watchers. Its proximity to the Pea Island Wildlife Refuge, just across the Bonner Bridge, means that hundreds of species pass by the Bodie Island Lighthouse on a regular basis. On your next visit, be sure and bring your binoculars and your camera. Where is the Bodie Island Lighthouse? 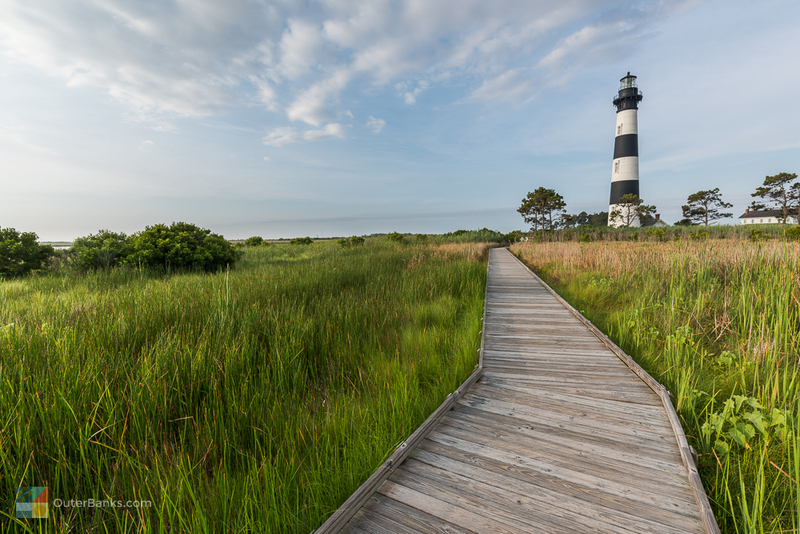 The Bodie Island Lighthouse is located HERE just south of Nags Head, and is approximately 7 miles south of Whalebone Junction, which is the intersection of US 64, US 158, and NC Highway 12. When was the Bodie Island Lighthouse built? The Bodie Island Lighthouse was built in 1871, and was first operational in 1872. The current structure is actually the third lighthouse to guard this region of the Outer Banks coastline. The first Bodie Island lighthouse was built in 1847 and had to be abandoned due to a failing foundation, while the second lighthouse, which was built in 1859, was destroyed by retreating Confederate troops to keep it out of Union hands in 1861. How do you pronounce the Bodie Island Lighthouse? Bodie Island Lighthouse is pronounced like the word “Body.” It does not have a long “OH” sound. How many steps are in the Bodie Island Lighthouse? 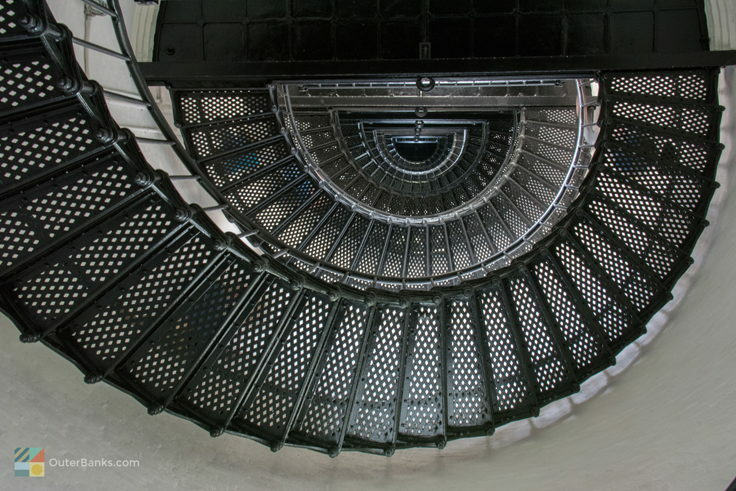 There are 214 steps from the foundation to the top of the Bodie Island Lighthouse. How do you get to the Bodie Island Lighthouse? Visitors from the north can take US 64 or US 158 to the intersection of NC Highway 12, and then head south for approximately 7 miles. From the south, Hatteras Island visitors can take Highway 12 north across the Bonner Bridge and Oregon Inlet. Can you climb the Bodie Island Lighthouse? The Bodie Island Lighthouse is seasonally open for climbers in the summer months for a small fee. 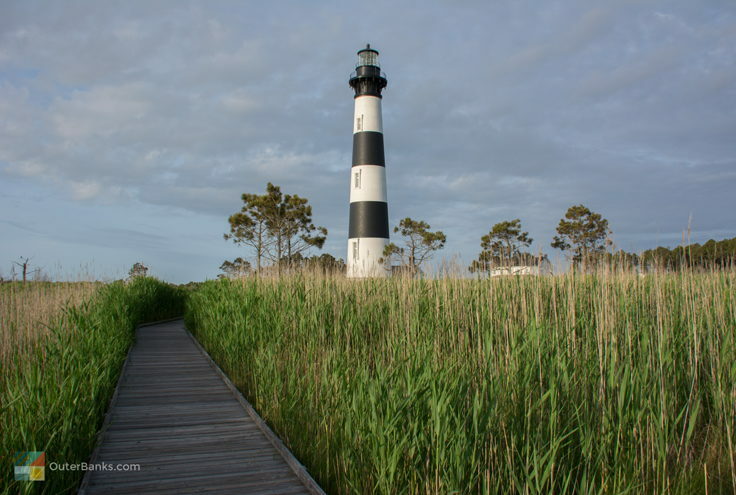 When can you climb the Bodie Island Lighthouse? The Bodie Island Lighthouse is open for climbers from the third Friday in April to Columbus Day in October. Ticket sales begin at 9 a.m. daily, with tours running every 20 minutes until the last climb at 4:30 p.m.
Can you climb the Bodie Island Lighthouse at night? The Bodie Island Lighthouse is not open for climbing after 4:30 p.m. However, the Cape Hatteras Lighthouse, which is located about 40 miles south of Bodie Island Lighthouse, offers Full Moon Tours in the summer months. Does it cost money to climb the Bodie Island Lighthouse? There is a small fee to climb the Bodie Island Lighthouse. Special discounts are available for children, and senior citizens who are 62 years old or older. Why is the Bodie Island Lighthouse important? 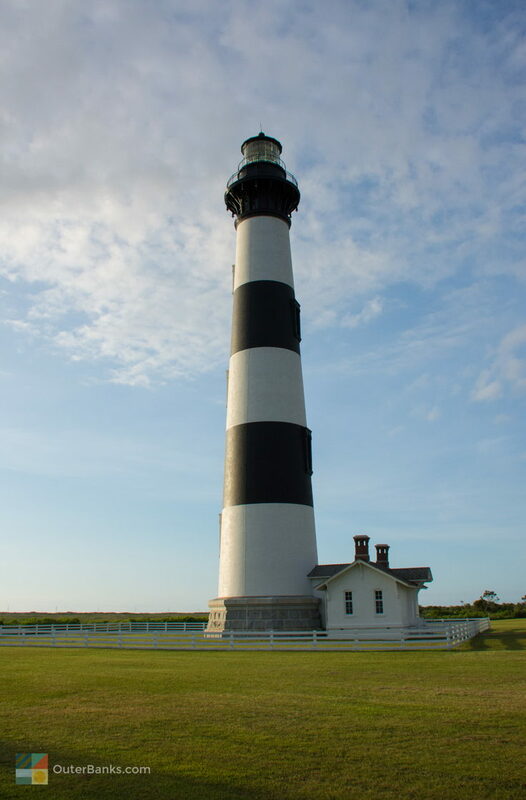 The Bodie Island Lighthouse is distinctive for its black and white horizontal stripes. The current structure, which was completed in 1872, is one of only a handful of brick tower lighthouses that remain in operation in the United States. Bodie Island Lighthouse is also just one of a few lighthouses that use an original first-order Fresnel lens. Why was the Bodie Island Lighthouse renovated? The Bodie Island Lighthouse was closed to climbers for several decades due to safety issues. However, after a 2013 renovation, the lighthouse reopened to the public, and the structure can now be toured from top to bottom. When was the Bodie Island Lighthouse restored? The keepers’ duplex, which currently serves as the visitors center, was completed in 1992. The lighthouse itself, after years of fundraising, was renovated and re-opened for climbers in 2013.
Who owns the Bodie Island Lighthouse? The Bodie Island Lighthouse is within the Cape Hatteras National Seashore, and is managed and operated by the National Park Service. 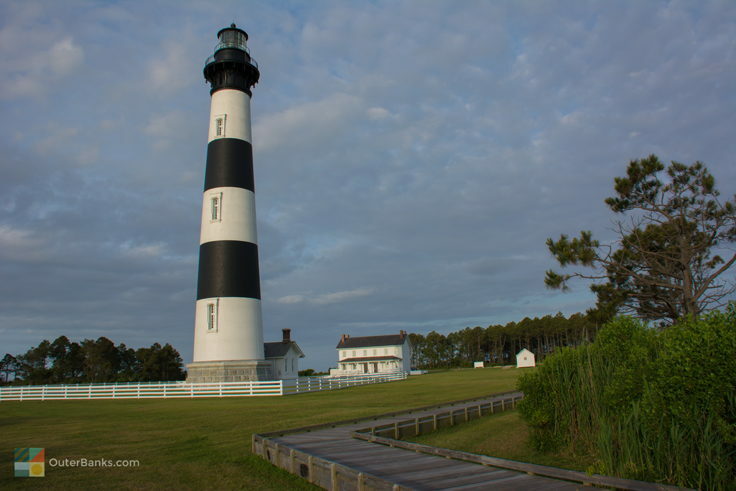 Where can you stay near the Bodie Island Lighthouse? 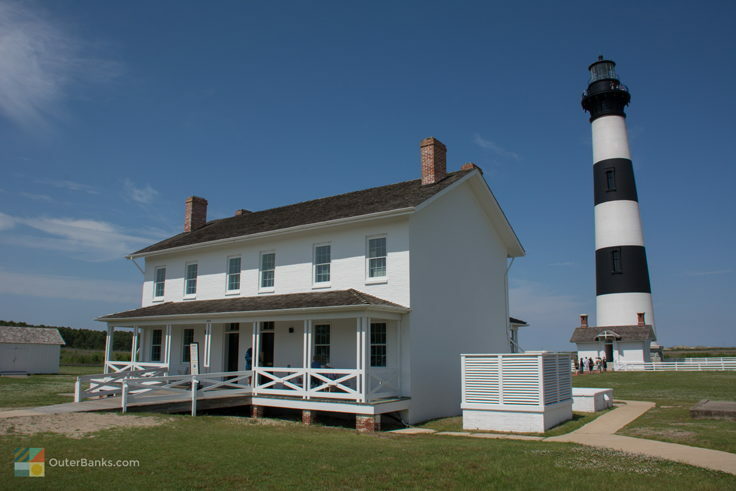 Though the immediate area surrounding the Bodie Island Lighthouse is undeveloped and is part of the Cape Hatteras National Seashore, visitors will find a number of vacation rental homes and several hotel options in neighboring South Nags Head. A seasonal National Park Service campground is also located nearby, next to Coquina Beach. Are there tours of the Bodie Island Lighthouse? Tours of the Bodie Island Lighthouse depart every 20 minutes from roughly 9:00 a.m. until 4:30 p.m.
Do I need reservations to climb the Bodie Island Lighthouse? Reservations are not required, and tickets to climb the Bodie Island Lighthouse can be picked up at the visitors center on the day of the climb. Is the Bodie Island Lighthouse lit? How often is the light rotation at the Bodie Island Lighthouse? The Bodie Island Lighthouse makes a full rotation every 27.5 seconds. How far away can you see the Bodie Island Lighthouse light? On a clear night, the Bodie Island Lighthouse can be seen from up to 19 miles away. 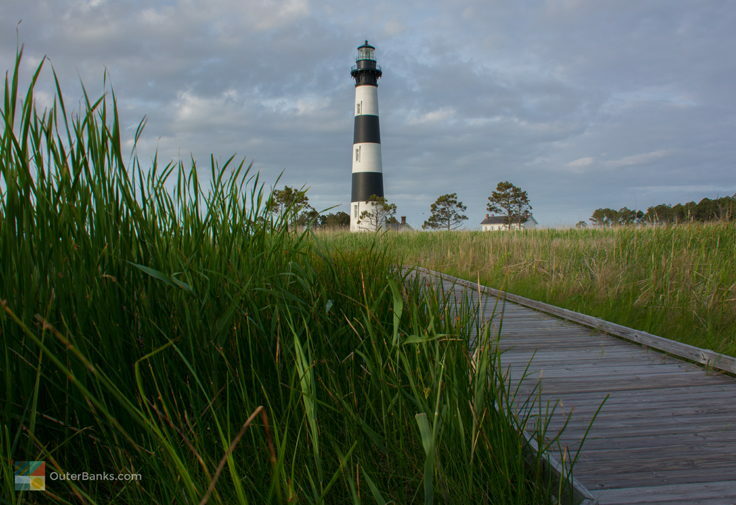 What kind of light does the Bodie Island Lighthouse have? The Bodie Island Lighthouse has a restored First Order Fresnel lens which has been electrified and is fully automated. Is there a Bodie Island Lighthouse museum? 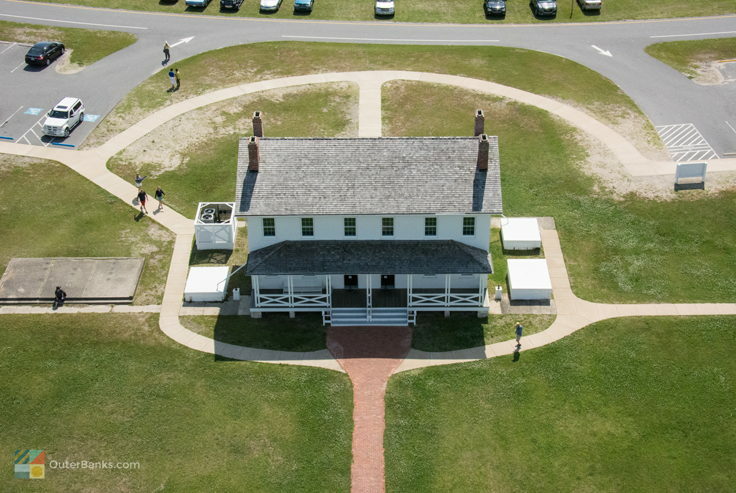 A visitors center and museum can be found on the grounds of the Bodie Island Lighthouse. Where can you eat near the Bodie Island Lighthouse? 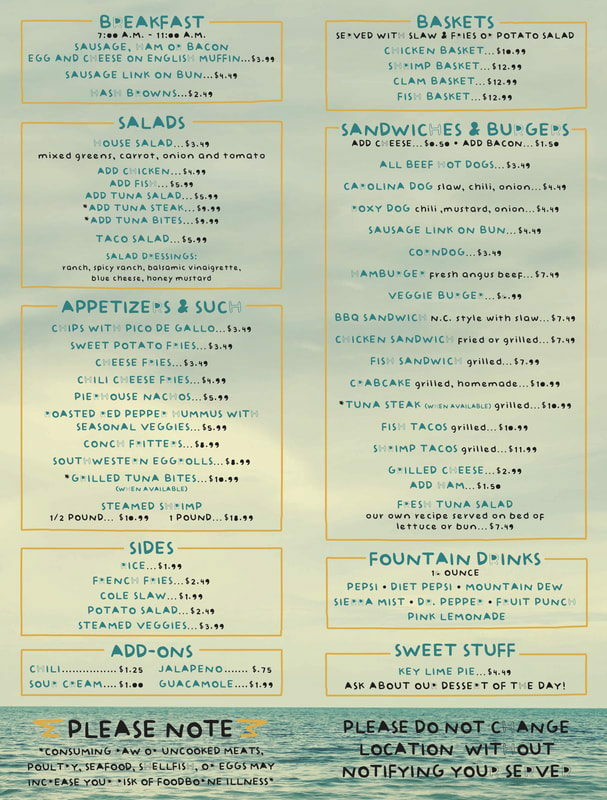 Visitors will find a number of restaurants in the nearby town of Nags Head, which is located approximately 7 miles away. Because the Bodie Island Lighthouse is within an undeveloped portion of the Cape Hatteras National Seashore, there are no stores or restaurants in the immediate vicinity. Does the Bodie Island Lighthouse have a gift shop? The visitors center at the Bodie Island Lighthouse does have a small gift shop, and there are ample lighthouse souvenirs at nearby shops in Nags Head. Are there any restrooms at the Bodie Island Lighthouse? Restrooms are located at the base of the Bodie Island Lighthouse, at the on-site visitors center complex. Call 252-441-5711 for current hours.